Vacancies of Industrial Mazdoor, Tin Smith and Fireman. As per notification of Indian Army 45 COY ASC Supply Depot Agra Uttar Pradesh, total no. of posts are 18. Mode of Application is offline. Last date to send Application forms for Industrial Mazdoor, Tin Smith and Fireman Group C Vacancies is 21 days from the date of advertisement. 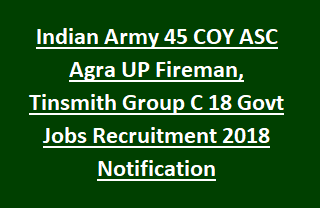 All details of Fire Fitter Tin Smith and Fireman Group C Jobs Recruitment 2018 in Indian Army 45 COY ASC Supply Depot Agra Cantt Uttar Pradesh are mentioned below. As per notification of Indian Army 45 COY ASC Supply Depot Agra, total no. of posts are 18. Aspirants who will be selected for above posts, will get the salary of Rs.5200/- to Rs.20200/- per month and Grade Pay is Rs.1800/- or Rs.1900/-. 1. For Mazdoor, Fireman posts Qualification is Matriculation. 2. For Tin Smith posts, Qualification is Matriculation and ITI. 18 years to 25 years for General and Ex-Servicemen category candidates; 18 years to 28 years for Reserved category candidates (OBC); 18 years to 30 years for SC/ST category candidates. Candidates must have Height 165 cms ; Chest 81.5 cms (Un-Expanded); Chest 85.0 cms (On-Expansion); Weight 50 kgs. For Fireman jobs written exam will be conducted for 150 marks. For Fire Fitter and Tim Smith vacancies written exam will be held for 100 marks. Written exam will be objective type and exam duration is 2 hours. 0.25 negative mark will be deducted for each wrong answer. Aspirants fulfilling required eligibility conditions may send application forms as per proper format affixing two passport size photographs along with the relevant documents of Qualification, Birth certificate, Caste certificate, Character certificate, proof of residence to below mentioned address.